Persian cuisine is exotic yet simple like a poem by Omar Khayyam, healthy yet colorful like a Persian miniature painting. It combines rice, the jewel and foundation of Persian cooking, with a little meat, fowl or fish; plenty of onion, garlic, vegetables, fruit, nuts, herbs; and a delicate, uniquely Persian mix of spices such as rose petals, angelica seeds, dried limes, candied orange peels, cinnamon, cardamom, cumin and saffron to achieve a delicious and balanced diet. Drawing on her 15 years of experience collecting and adapting authentic Persian recipes, and inspired by her years in Southern France and the United States, Najmieh Batmanglij has brought about a marriage of ancient Persian cooking, French Provencal food presentation, and contemporary American eating styles. The result is Persian Cooking for a Healthy Kitchen, 95 exquisite kitchen-tested recipes that are low in fat yet high in flavor–a feast for both the eyes and the taste buds–that meet the current health goals of limiting the calories from saturated fats. The recipes have been kitchen tested by both American and Persian chefs. They are intelligently written and easy to follow, one per page, each facing a magnificent photograph by the renowned French photographer, Serge Ephrahim. I found my way to this book by a roundabout route. When my husband and I were living in southern France in the early 1980s, the countryside, the crooked streets, the broken tiles, the perfume of wisteria and jasmine, the captivating kitchen aromas of onions, garlic and parsley all summoned back memories of my childhood in Iran and inspired me to write a cookbook in French, Ma Cuisine d’Iran. Later, we moved to America, and I wrote a cookbook in English, Food of Life: Ancient Persian and Modern Iranian Cooking and Ceremonies, and then a successor volume, New Food of Life, which included samplings of Persian literature and miniatures as a cultural backdrop for the recipes. France remained part of our lives. We continued to spend part of the year at our house in Vence, and those months always re-awakened memories of the beautiful aspects of Persian culture and traditions: the poetry, music, markets and bazaars; the rose gardens and fountains; the orchards of pomegranate and quince; the intoxicating perfume of Seville orange groves in blossom; the magic of old persimmon trees in autumn. Similarities between the Iran of old and the villages of southern France are many-not just the crooked streets and the aromas but also the temperament of the people and the styles and ingredients of the cuisines. As for America, it affected my cooking interests as well, especially with the shift toward lighter, healthier eating styles. I found myself becoming more and more conscious of the fat content of Persian food. Although Persian food is one of the oldest cooking traditions in the world, it is little known in America. This is less true of France, as my husband and I discovered when we first visited the restaurants of such heralded young chefs as Roger Vergé and Alain Ducasse. I was amazed when one day I saw a traditional Persian dish, Sheep’s Head and Trotters Soup, on Alain Ducasse’s menu at the Terrasse of the Juana Hotel. It came with a mixed vegetable pickle, torshi, which is exactly how it is served in Iran. When I spoke to him about it and commented on his use of a fresh sprig of mint as a garnish for many dishes, he said, “Of course I have been influenced by Middle Eastern cooking.” Recently, in a gourmet market in Washington, D.C., I noticed quince and rose-petal jams with Roger Vergé’s labels on the jars. In all candor, I must say that my quince and rose-petal jams are better. Why look to France for the secrets of ancient Persian cooking? Go to the cultural sources. This book draws on my 15 years of researching Persian traditions, collecting recipes, and presenting authentic Persian food and ceremonies in books, articles, lectures and cooking classes. But it is also a new road for me. The purpose of what follows is to modernize–to adapt Persian recipes to today’s low-fat, high-flavor eating styles. The foundation for much of Persian cooking is rice. When rice is combined with a little fish, fowl or meat, plenty of onion, garlic, vegetables, fruit, nuts and herbs, and a delicate mix of spices such as rose petals, dried limes, candied orange peels, cinnamon, cardamom, cumin and saffron, the result is a dish both healthy and uniquely Persian-as colorful as a miniature, exotic yet simple like a poem by Omar Khayam. All the recipes for the main dishes fall within the current health goal of limiting calories from saturated fats to 25 percent of one’s total food intake. For sautéing and frying, I have used olive oil instead of butter. For dairy products, I have used low-fat varieties: low-fat milk, yogurt and whey. The presentation of the recipes in the photographs is the result of my collaboration with Thierry Jeanneret, a young and very talented French chef. He was interested in knowing more about the use of spices in Persian cooking, and I wanted a contemporary look for the presentation of Persian food. 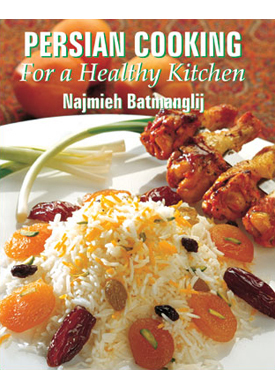 Not all Persian recipes could be adapted to meet my criteria of low-fat and high-flavor, but each of the 95 recipes in this book works, and works well. They have all been tested by both Iranian and American chefs. In fact, I have been using only these recipes at home for the past two years. Initially worried that my husband and younger son, both “butter men,” would complain, I would add butter to their plates separately, but for the past year I have not been doing that and they have not been complaining. In Persian cooking, every herb and spice is viewed as having its own nutritional and pharmacological properties. I have tried to remain faithful to the original herbs and spices used by my mother and her mother before her. Since ancient times, saffron has been renowned for salubrious and aphrodisiac powers; cumin seeds are said to reduce stomach gas, rose petals and rose water to relieve stomach upsets. Barberries have been used for thousands of years to lower blood pressure and, in juice form, to cleanse the system. Seville orange peels are believed to aid digestion. Verjuice (juice of the unripe grape) is an ancient remedy for rheumatism. Angelica seeds (gol-par, which in Persian means the flower of angels) are appropriately thought to have angelic healing powers. But ultimately, cooking is about sharing, not making, and if these recipes are prepared with love, you too will indeed share their magic. The French would say Bon Appétit, but in Persian we say Nush-e jan: Enjoy this food of life.